The Wednesday Evening Fiddlers was founded in February of 1988. 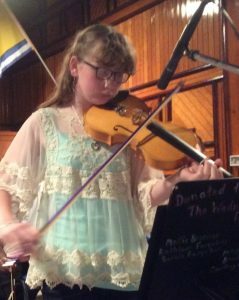 Our group includes fiddlers and accompanists from the Victoria/Carleton County region of New Brunswick and neighboring Aroostook County Maine. We play for many local fundraisers, nursing homes, variety shows and jamborees. On any given occasion we have fiddlers from age 10 to 95 on stage playing Downeast-style fiddle selections. Request to have us play at your event. We have a public jam session and practice each Wednesday, 7:00 PM at St James United Church Hall, West Riverside Dr., Perth-Andover. Musicians and listeners are always welcome. Enter at the back of the hall. There is a voluntary donation (the fiddle at the entry) and thank you. Proceeds are used to send our young folks to fiddle camp and other projects. We are always looking for beginner fiddlers of any age to learn and play with us so come on out. During the school year, fiddle lessons are available. We also have step-dancing lessons. Contact us to find out more. We host a public Fiddle-Doo in late September and a Christmas Party in December. These events include dancing and a pot-luck supper. So come on down and dance, clap and tap your toes. This is a link to a very nice story about Garold and the Wednesday Evening Fiddlers by Gary Grieco. Here’s all my music pdf’s. Look under WXYZ.